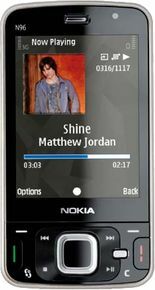 Nokia N96 is currently not available in any stores. Watch your favourite video songs and movies in video player. It supports MPEG4, H.264, WMV, RealVideo file types. Listen to your favourite songs in music player. It supports MP3, AAC, eAAC, eAAC+, WMA, RA, M4A (Apple lossless), MP4 etc. file types. Maybe Nokia N96 wasn't really intended to take the market by storm and turn the world around. Maybe it was meant to quietly update the top multimedia gadget of the house and continue to cash in. Review: Another great multimedia phone from Nokia - but isn't it much the same as the last one? The N96, like both flavours of N95, is a great multimedia phone, but it's a fairly straightforward upgrade on its predecessor, with increased memory as well as the thinner and lighter casing the main advantages. The Nokia N96 features 16GB of storage and advanced multimedia features, including a 5-megapixel camera. The smartphone also has integrated Wi-Fi, Bluetooth, GPS, and 3G support. The N96 froze on a couple of occasions and can sometimes be sluggish. Nokia's Ovi services aren't fully activated in North America, so you can't take advantage of those extra capabilities. It's also expensive. The N96 has everything a gadgeteer could want, including vast amounts of memory, a good camera, great video playback quality and built-in GPS. But its build quality is a bit iffy and it's not as easy to use as the iPhone. Web browser not as good as Safari.